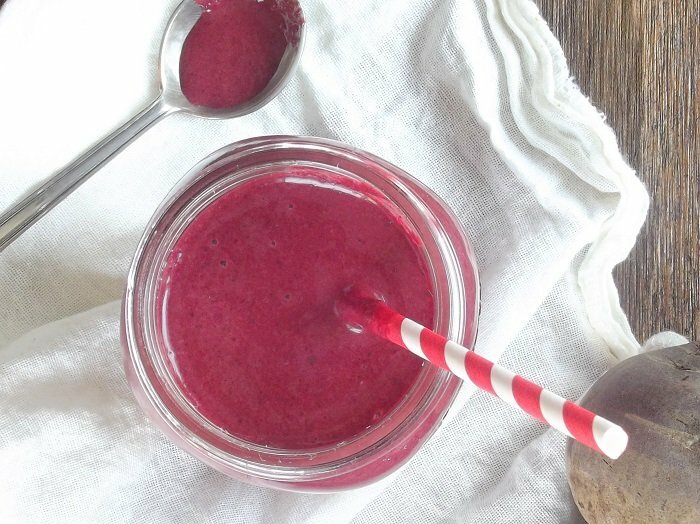 I’m trying to get back into the habit of posting smoothie recipes over the weekend. I did that for a while, as I usually end up trying a new smoothie recipe over the weekend, and it seems to make sense to share it with you guys for trying out some future weekend. Life’s been a little hectic lately though. I’ve learned that the thing about running both a law practice and a vegan food blog is that business for both picks up like crazy in the early months of the year, so catching up on sleep had to take precedent over weekend posts for a while. I actually intended to post this one around Valentines day, as I thought the red color would make it appropriate for the occasion. That didn’t happen. It’s red, and chocolate, but it’s not exactly a dessert, which is what I like to focus on for Valentine’s day. 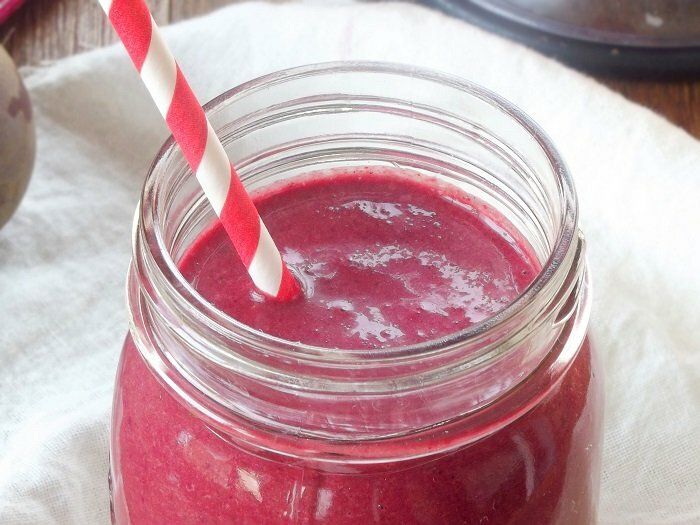 It’s tasty, but, red color aside, it’s really more of a green smoothie. Maybe you can enjoy it for Saint Patrick’s Day. Why green? I threw in the beet greens as well as the roots. In truth, most of the time when I buy beets, I seek out beets without the greens. I’ve tried cooking with them and haven’t been impressed. They’re a bit delicate for my taste, and seem to cook up a bit on the mushy side (suggestions?). I hate to see them go to waste though, especially as they’re supposed to be loaded with nutrition. On this weekend before Valentine’s day, as is often the case, I went shopping for beets and wasn’t able to find the roots sans greens. I bought them anyway, and decided to throw everything in the blender. It worked! I liked it! It was rich, tasty, filling, and packed with whole veggies. It would make a great light breakfast or snack. It’s not quite a dessert, but it’s chocolatey and as sweet as you want it to be. I don’t have kids so I can’t say for sure, but if you have trouble getting them to consume veggies, I’m betting sneaking them into a bright red chocoaltey drink will do the trick. Separate the beet greens from the root. Wash greens well (they tend to be a bit gritty) and coarsely chop. Peel the root portion and cut into 1 inch chunks. 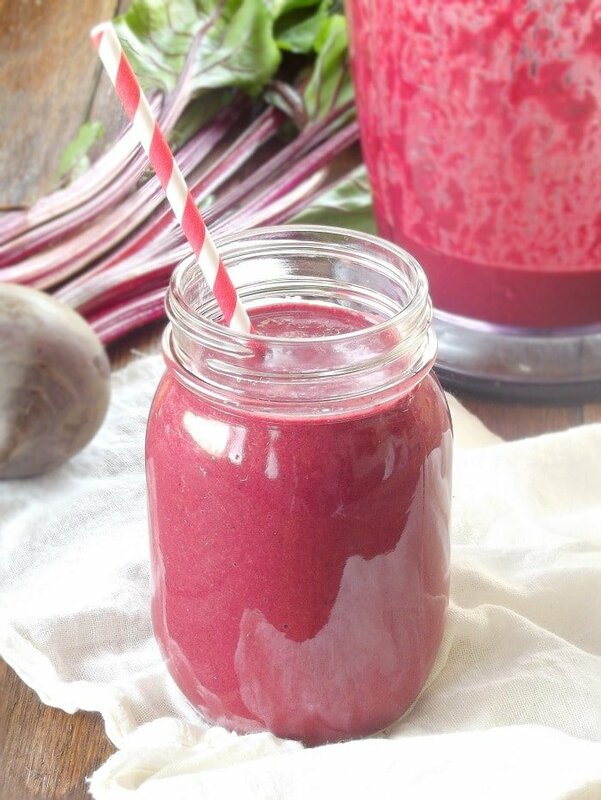 Place beet roots and greens into blender, along with banana, cacao powder, almond butter and berries. Blend until smooth, stopping to scrape down sides of pitcher as needed. Add milk and sweetener to taste. Blend again until smooth. Girl, I hear ya! I don’t know how you keep up your posting pace, for me it’s such a struggle. 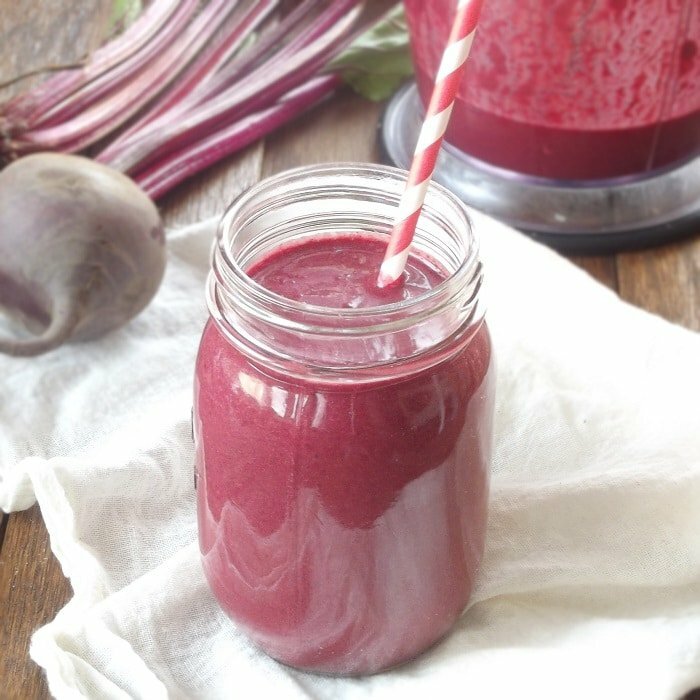 But beets in smoothies, yes! This is a new thing for me but I love it. I’m so down with this chocolate berry version, too! As for beet greens, my favourite Indian cookbook has an Ah-mazing recipe for beet greens. I’ll email it to you if I can remember! Clean and chop – separate the stems from the leaves – stems take longer to cook. Throw stems in a saute pan with about 2T of water (or 1/2t. olive oil if you don’t mind the fat) and a clove of squished garlic (or 1t. garlic powder). When the stems seem fairly soft toss the greens on top and add 1T. of lemon juice (you can even used the bottled variety). 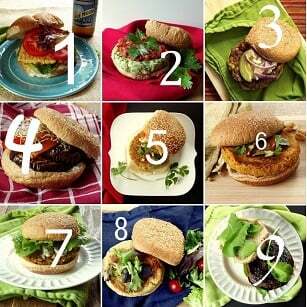 When the greens are wilted – eat!! So so so good and the vitamin C from lemon juice helps you to absorb the iron in the greens. oh. i love the idea of using the beet greens! also, i love the beautiful color that the blended beets and cocoa powder create.